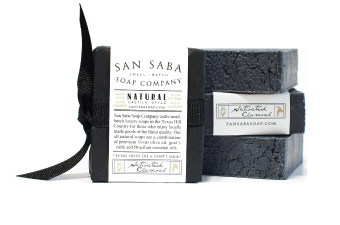 Shop The Collection - San Saba Soap Co.
Richly lathering with the calming yet refreshing scents of Lemongrass and Lavender essential oils. 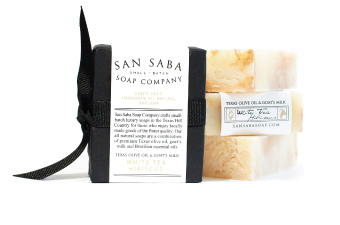 Made with 100% premium Texas olive oil with added goat’s milk, this delicate natural fragrance is perfect by the sink or bath. Heavenly fragrance of sweet and spicy Tobacco Bloom with additional essential oils of Chamomile and Calendula. This bar has the added benefit of French Pink Clay in the base, a micro-polisher fine enough for all skin types. The tantalizing herbal Rosemary and premium Lavender essential oils combine with our olive oil and goat’s milk base for the perfect body cleansing bar. Top selling bar for both men and women. 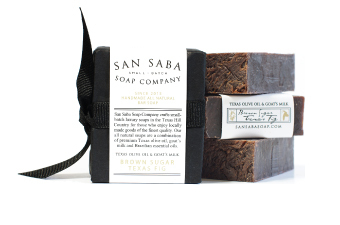 Texas fig is loaded with Vitamin A and beta-carotene while our super dark brown sugar acts as a natural moisturizer and natural glycolic acid – part of the alpha hydroxy acid family. 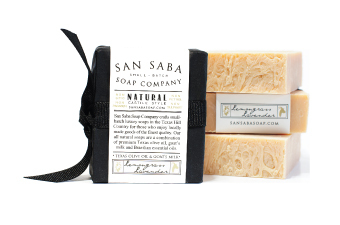 The fresh scent is enhanced with Lavender and Vanilla Bean essential oils. This is the ultimate face wash.
An intense blend of Cedarwood, Lavender, Cinnamon and Clove essential oils. This is a powerful bar with exceptional exfoliating capabilities. A top seller among men, but the scent is well balanced. An incredibly floral bar for the bath or powder room. Top notes of Hibiscus and Peony essential oils are balanced with subtle White Tea and marbled throughout with fine Mica. Hibiscus essential oil is a natural anti-inflammatory and high in Vitamin C.
Removes dirt and oil with out over-drying, making it the perfect soap for blemish prone skin. 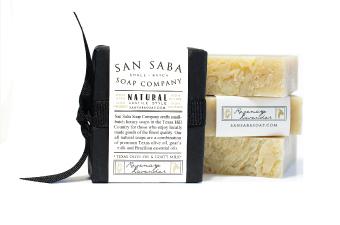 This bar has intense essential oils of Vetimer, Bergamot and Holy Basil. 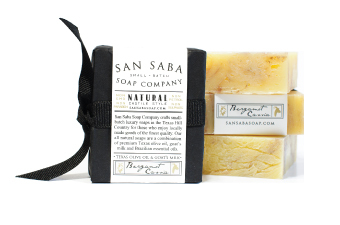 It includes premium Texas olive oil, organic sunflower oil and organic coconut oil. Another fragrant bar excellent for the active body. 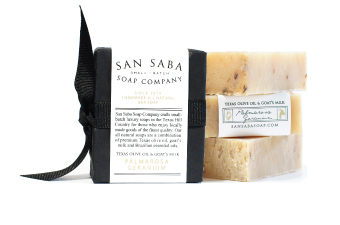 Earthy top notes of Palmarosa essential oil blended with the floral Geranium creates a balanced bar for men and women. Geranium has a rose-like aroma while Palmarosa is in the same family as Lemongrass. 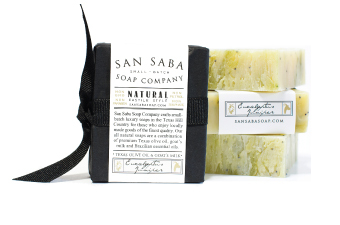 Brazilian essential oils of Eucalyptus, Juniper and Tea Tree coalesce to create an herbal blended bar. It has a slightly exfoliating lather. Made with light Spirulina microalgae for its detoxifying and gentle toning properties. A top scent for 2018, the citrus oils of Bergamot, uplifting Lemon and spicy Cassia make this an incredible body bar. This is a great post-workout bar when muscles are tired and stiff, since Cassia is a “hot” oil in the same family as Cinnamon. 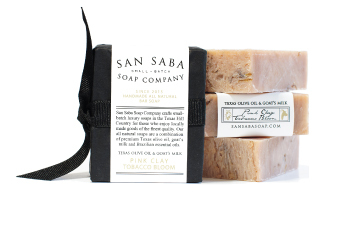 San Saba Soap Company’s All Natural Heirloom Oil© is an intoxicating, all natural perfume oil made with fine distilled essential oils in a sweet almond and jojoba base. 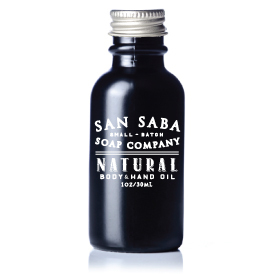 The Body & Hand Perfume oil is scented with seven fine distilled essential oils including Bergamot, Rose and Chamomile. 1oz. There are no synthetics, no parabens, alchohol, binders, emulsifiers or Phthalates. 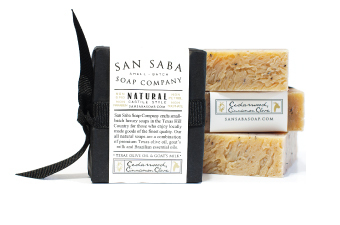 San Saba Soap Company’s All Natural Heirloom Oil© is a superbly scented, all natural cologne oil made with fine distilled essential oils in a sweet almond and jojoba base. The Face & Beard oil is scented with seven fine distilled essential oils including local Texas cedarwood, lavender, and clove. 1oz. Beards are not only stylish, they’re good for you when maintained properly, warding off sun and pollen. Keep your face and beard healthy with our grooming cologne oil specifically formulated for men and facial hair.